Take the free practice test below to see what type of questions appear on an ASE auto mechanic certification exam. An auto mechanic can get certified by taking the Automotive Service Excellence (ASE) exams, covering fourteen different subject areas, such as diesel and gas engines, trucks, buses, damage repair, auto components and much more. For complete A Series practice, go to the A1 - A8 Practice Test Set with 800 Questions. Our ASE practice test materials were written by Dr. John Kershaw, an ASE test prep expert. 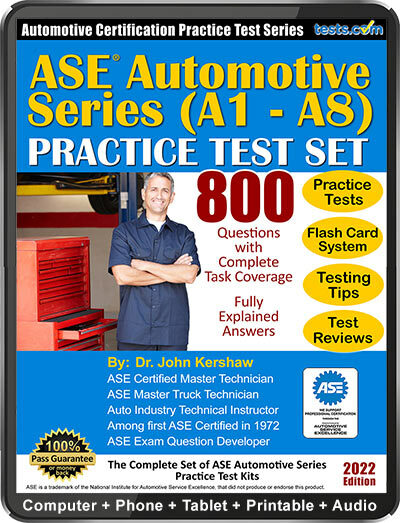 Dr. Kershaw has been an ASE test question developer, ASE Certified Master Technician, ASE Master Truck Technician, auto industry technical instructor and was among the first candidates certified by the ASE in 1972. 1. You are replacing brake pads. You've already removed the wheels. What is the appropriate next step for most vehicles? 2. A low-mileage vehicle is running hot. Assuming the radiator has enough coolant, what is the most likely problem? a. The block has a partial restriction. b. The water pump has broken down. c. The thermostat has stopped working. 3. A car is pulling to one side as it drives. The most common causes of this problem are listed below. Which one should you check first? 4. When you replace an oil drain plug, you should retighten it according to the old maxim "snug, but not too hard." 5. In what order should you replace spark plugs? 6. You are replacing a fuel tank. You've drained and stored all the gas in the vehicle. What is the next step? a. Take the straps off the tank and drop it. b. Disconnect the fuel lines. c. Drop the rear suspension. 7. A vehicle comes into your shop with a transmission problem. What is the FIRST thing you should do? d. Disassemble the transmission and check the gears. 8. Problems with spark plug wires are almost always caused by cracks in the insulation. 9. You are completing a radiator flush. You have drained the old coolant and added the flush solution. What is the next step? a. Turn the vehicle on and let it run until it reaches its normal operating temperature. b. Turn the heater on and let it run at the highest setting for 10 minutes. c. Drain the solution and add fresh radiator coolant. 10. An engine is misfiring. Which of the following is NOT a likely cause? a. The ignition timing may be set wrong. b. The cooling system may be malfunctioning. c. The fuel filter may be clogged. d. The vehicle may have a vacuum leak. 11. What is the last step in a brake job? c. Press the brake pedal to make sure the brake pressure is satisfactory. 12. An air filter should not be replaced until it shows visible signs of accumulated particles. 13. Black smoke is mixed into the exhaust of a vehicle you have been tasked to repair. Which of the following is a likely cause? 14. Which of the following is NOT a possible cause of an engine hesitating? a. The air filter needs to be replaced. b. The ignition wires need to be replaced. c. The fuel filter is clogged. d. The engine has a vacuum leak. 15. A vehicle is knocking when it goes over bumps or cracks in the road. Which of the following is a likely cause of the problem? b. Shocks or struts that need to be replaced. 16. It is recommended that a timing belt be replaced at the manufacturer's suggested interval if a visual inspection reveals only minor fraying. 17. A brake pedal has to go down too far to stop. Which of the following is not likely to be a cause of this problem? 18. What type of fuse is a car made before 1980 likely to have? 19. What is the most common reason a car will not start? 20. The water pump is the most important part of any vehicle's cooling system. 21. An engine has recently begun using a lot of oil and the coolant is foamy and brown. Which of the following is likely to have caused this problem? a. A cylinder head has been cracked. b. A head gasket has blown. c. The oil-to-water cooler is leaking. 22. Transmissions have a tendency to start leaking over time. Which of the following is NOT a common spot for a leak to occur? 23. Why is it necessary to compress the brake piston when you are replacing brake pads? a. You can not take the old pads off without compressing the piston. b. You have to compress the piston so that you won't damage the new pads. c. It is not necessary to compress the brake piston before replacing the pads. 24. When a car battery develops problems, it is most often because of dirty posts. 25. A vehicle is having difficulty with steering. Which of the following is the most likely cause? a. The power steering belt needs to be adjusted or replaced. b. The vehicle is low on power steering fluid. c. The power steering pump needs to be replaced. d. The power steering rack is leaking. 26. Which of the following is NOT a common reason the CHECK ENGINE light comes on in most vehicles? a. The battery is dying. b. The gas cap is loose. c. The spark plug wires need to be replaced. d. The engine has somehow gotten wet. 27. Which of the following is a common cause of an engine consuming too much oil? Assume there is no oil in the exhaust. 28. The most efficient bank angle for a six cylinder engine is 60 degrees. 29. A brake pedal has no or little air pressure. Which of the following is not likely to be the cause? 30. A vehicle comes into the shop with gray or blue smoke in the exhaust. Which of the following is likely to be the cause? b. The PCV valve needs to be replaced. ASE administers a series of board certification exams. Individuals can become certified as automobile and light truck technicians. Learn more with The Guide to Automotive Service Excellence Certifications and Tests.com's interview with James Hwang, ASE Expert.